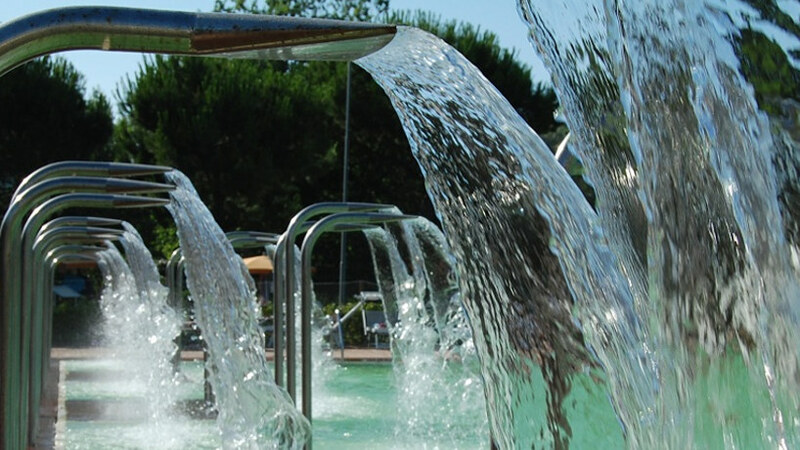 The Perle d’Acqua Spa Park in Riccione affords a unique and regenerating experience. A feeling of wellbeing is combined with fun to create a time of pure pleasure for the whole family. The park is right next to the Riccione Spa centre, which is renowned for its four springs whose waters are rich in sulphur, brine, bromide, iodine, and magnesium, which have an incredibly beneficial effect on the whole body. During your holiday in Riccione, regenerate your body and spirit at the Perle D’Acqua Park in Riccione, immersed in a green pine wood that covers a surface area of three hectares, right by the sea. Bathe in the precious Spa water, which is heated at a constant temperature of 30° C in the large 800 m2 swimming pool, and allow yourself to the pampered by the water jets of seven colourful waterfalls. The Perle d’Acqua Park also boasts the longest revitalizing water routes in Europe: routes that are over 140 metres long and characterised by different water temperatures and water jets that will bring a feeling of lightness and harmony to your legs and, thus, to your whole body. A day at the Spa Park in Riccione will allow you to regain your balance and a feeling of inner and outer wellbeing. Perle d’Acqua Park also offers safe equipped areas for children: a games area with bouncy castles, swings, and creative workshops that are run by qualified staff; and a heated swimming pool that is only 60 cm deep, to ensure the fun and safety of all children. If you stay at our hotel near the Spa Centre in Riccione you can treat yourself to unforgettable times at the Perle d’Acqua Park in Riccione by purchasing admission tickets at a special price. Our hotel, in fact, has a special deal agreement with the park so our guests only pay 12 Euros for the full day ticket. If you are looking for a quality holiday at a good price that includes wellness and fun, come and see us in Riccione. We will give you an ocean of fun.